PayPal Website Payment Standard - This is the original PayPal service. Customers are taken off of the store site to PayPal's site to complete payment, with order notification sent back to the cart. This method does not require customers to have a PayPal account. PayPal Express Checkout - This service also takes customers off of the store site to pay, and brings them back for shipping and final order processing, providing notifications of new orders for store admins. PayPal Payments Advanced - This option allows customers to pay by credit card or with their PayPal account, without ever leaving your site. Payment is handled through a form on PayPal's site which is embedded on your checkout page. This means your site never 'touches' the credit card information, which is great for PCI compliance. PayPal Website Payments Pro - This solution allows customers to pay by credit card directly through the store site and the funds will quickly and easily be posted to the named PayPal account. Note that if you enable PayPal Website Payments Pro, you also enable PayPal Express Checkout. PayPal PayFlow Pro - Probably the #1 payment gateway among our user base. Payments are captured, transmitted and processed securely and funds will go directly to the merchant account of choice. Please see this page for setup information for the PayPal PayFlow Pro gateway. Note that if you enable PayPal PayFlow Pro, you also enable PayPal Express Checkout. NOTE: PayPal Standard, Express and Advanced options now include the Bill Me Later feature. These steps are required for all 3 PayPal services. Version-specific additional directions are provided below. 1 - Open a PayPal Business account by clicking the PayPal logo at the top of this page. 5 - Click the “Request API Credentials” link. NOTE: If you see information on this page about 'Certificates', the wrong integration method was chosen on a previous attempt. Click the 'Remove' button to clear out the certificate, and then move on to step 6 choosing the Signature method. 8 - Click this link and enter the username and password you created for your PayPal Business account. You will be provided with the 3 API values needed for further steps below. 2. In the Payment Methods section, click the 'configure' link next to the PayPal Website Payments Standard entry (in MSx 9300 this is called PayPal Payments Standard). 3. Put in the values you obtained from PayPal for the 'API Username', 'API Password', 'API Signature', and 'PayPal Business ID' (in MSx 9300+ you only need the 'PayPal Account Email Address' which is the 'PayPal Business ID' email). 5. Finally, check the box next to PayPal Website Payments Standard and then click the 'Submit' button at the top or bottom of the page. PayPal.ForceCapture If this is set to true, orders placed through PayPal will always be captured immediately, regardless of the transaction mode in use for the rest of the site. PayPal.RequireConfirmedAddress If this is set to true, only customers who have verified their address through PayPal will be allowed to complete payment. PayPal.UseInstantNotification PayPal orders generally require the customer to click a 'Return to Merchant' button at the end to complete checkout. Customers don't always do this, which can lead to lost orders. PayPal has created a service called 'Instant Payment Notification' that cuts down on the frequency of this. If you are using that service (configured on PayPal's end), set this AppConfig to true. NOTE: You should also set the PayPal.ReturnOKURL AppConfig to a custom topic page that complies with PayPal's terms and conditions such as pps_return.aspx once you have enabled the IPN service, or duplicate orders can get created. NOTE: In MSx 9300 'PayPal Payments Standard' is not supported in the Smart One Page Checkout. 5. Finally, check the box next to PayPal Express Checkout and then click the 'Submit' button at the top or bottom of the page. PayPal.Express.ShowOnCartPage This determines whether or not the 'Checkout with PayPal Express' button is visible on the shopping cart page as well, or just on the final payment page. 2. 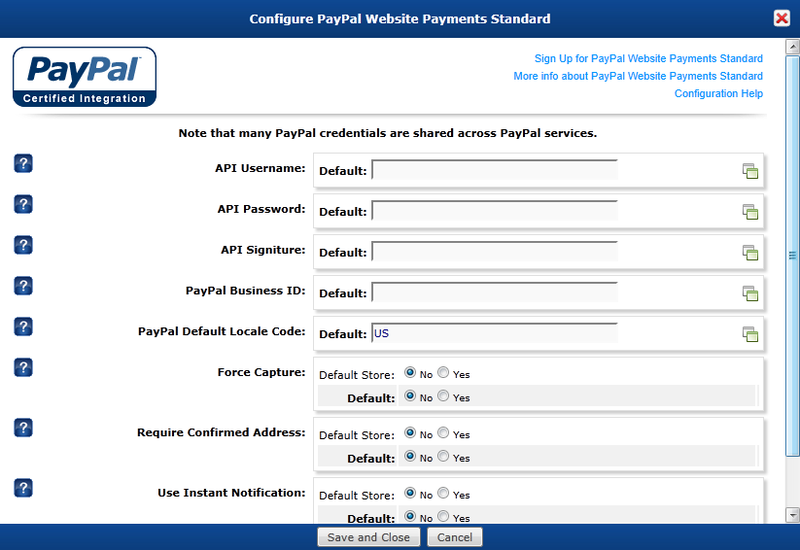 In the Payment Gateways section, click the 'configure' link next to the PayPal Website Payments Pro entry. 3. Put in the values you obtained from PayPal for the 'API Username', 'API Password', 'API Signature', and 'PayPal BUsiness ID'. 5. Finally, click the radio button next to PayPal Website Payments Pro and then click the 'Submit' button. NOTE: Enabling PayPalPro also automatically enables PayPal Express. •	If you have sales related questions about setting up NEW PayPal service and would like to speak directly to a PayPal Product Specialist, call 877-455-1484. •	If you have customer service related questions regarding an EXISTING PayPal account and would like to speak directly to a PayPal Customer Service agent, call 888-221-1161.